For over 50 years, the Nedato cooperative of 500 farmers has been producing quality potatoes to customers across the world. The cooperative has grown into a sustainable, customer-focused, innovative and cooperative potato organization worldwide. 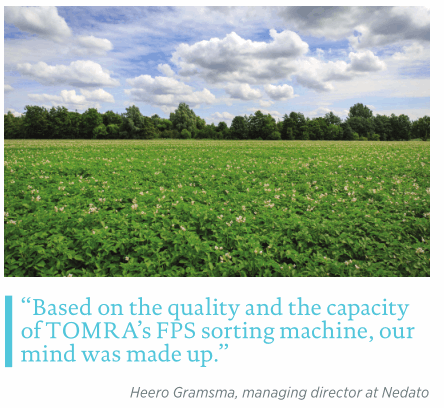 This case study tells the story of how the Nedato cooperative implemented automated sorting technology to boost the quality of its product and foster growth. Today, Nedato is a large sales and packaging organization that annually sells 250,000 tons of potatoes to the processing industry in the Netherlands, Belgium and Germany, and packs about 100,000 tons in different packages for the home-market and for export. By holding onto a number of important principles, Nedato has been able to continuously grow within the industry and the key to this success is down to the bond between the potato and the grower. Nedato is an innovative organization and this is reflected in the policy of production optimization, corporate philosophy, registration and monitoring of quality data and the deployment of the latest technologies. Heero Gramsma, managing director at Nedato, explains: “We are continuously looking into improving the quality of our potatoes and recently felt the time was right to invest in innovative technologies to update our existing grading lines.